"Who Goes There?" is the novella by John W Campbell on which John Carpenter based the classic film "The Thing", its presented here with another 6 short stories by the same author, mostly published within Astounded magazine in the 1930's. John W Campbell is widely regarded as being highly influential within the science fiction genre and was instrumental in awakening the "golden age" of scifi. Isaac Asimov himself was quoted as saying he was "the most powerful force in science fiction ever". I was a young teenager when I first saw the John Carpenter film "The Thing" and I was amazed at the wonderful script, ground breaking visuals (for the time) and fantastic atmosphere. It's a film that I fondly remember and is now a real classic, far superior to any more recent remakes and in my opinion also better than the 1951 version "The Thing from Another World" (although it has to be said that is a more accurate version). The power of this tale lies with this aliens abilities, able to shape itself into different forms, deceive and even mirror other people. Essentially it's an exploration of how we deal with things under extreme stress, how we do (and don't) cope in these situations and the indomitable power of the human spirit. 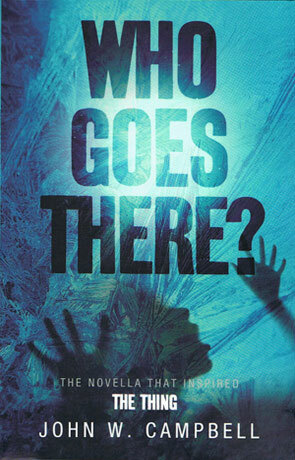 With a really claustrophobic feeling and a heightened sense of horror, Who Goes There? is classic science fiction at its absolute finest, a measure of what science fiction should be and worthy of being read again and again (and again). Blindness, which charts the life of a scientist struggling to find the holy grail of infinite power (while discovering the mysteries behind atomic power). Frictional Losses, follows the survivors of a world-wide alien invasion. We follow Hugh Thompson as he scavenges the ruins looking for parts to restore an alien weapon. Dead Knowledge, charts an expedition to a neighbouring solar system and the discovery of a seemingly high tech but abandoned planet (full of empty cities and streets). With no signs of war, illness or terror what could possibly have caused the planet to be abandoned without even birds or insects. Elimination, tells the story of a and arrogant American inventor who approached patent-lawyer John Grantland, claiming to have discovered how to revolutionize energy. Twilight, Jim Bendell picks up a hitch-hiker one night while travelling, who claims to be a time traveler from a far distant future where man's needs are taken care of by a vastly powerful machine. In this future mankind are on the brink of extinction, lacking any drive, ambition or even simple curiosity along with losing the ability to reproduce. Night, this short story follows on from the events of Twilight with our time traveller recounting his experiences of finding our sun and earth both frozen and dying. Every single one of these seven stories are pure science fiction gold, not only standing the test of time after 80 years but simply inspired works of fiction. Anyone really interested in science fiction should read this collection and see how it's written by the very best. Written on 9th January 2012 by Ant.